The project was established as part of a program sponsored by UJA-Federation of New York's “Give a Mitzvah, Do a Mitzvah” program, which helps kids brainstorm projects, and gives them the resources to actualize the projects. Over the past several years, scientific studies have shown that knitting is an excellent therapy for the kind of constant stress residents of places like Sderot are constantly under. The activities involved in knitting – the automatic movements, the focus on parts of the project, and the physiological movements – have been shown to not only reduce stress, but to also possibly help memory retention, and even reduce the effects of chronic pain. 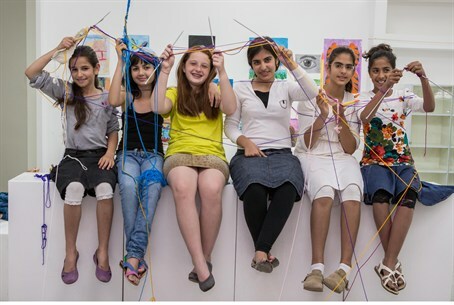 As a result of Noa’s initiative, a special class was recently opened in Sderot, where young girls started to gather for knitting classes. This class has become a very well-known and demanded activity among young girls in the city. This week, Noa arrived in Israel with her family as part of her Bat Mitzvah trip and, especially, to meet the girls in Sderot. The emotional meeting took place Wednesday when Noa finally met them face-to-face and had the opportunity to knit together.